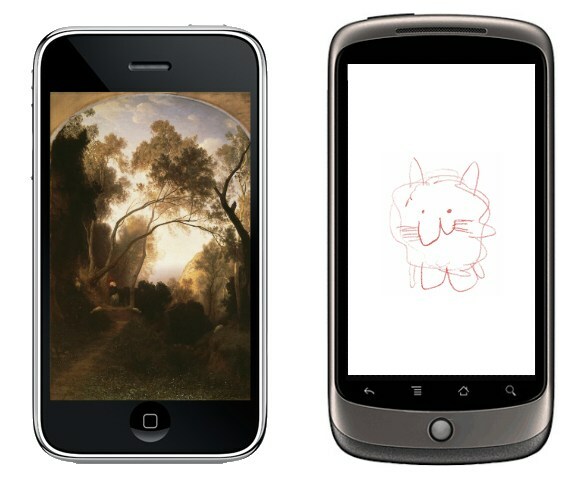 Is the Nexus One's display inferior to the iPhone's? Well – not entirely. After all, it’s bright, responsive, and has a much higher resolution. But there is a lot more to making a good screen, and under a detailed analysis it’s far from a rout when you pit HTC’s bleeding-edge OLED screen against the old-school LCD of the iPhone . As has been noted before, the Nexus One uses a PenTile sub-pixel layout, which is a sophisticated new way of creating pixels which changes the layout of color sub-pixels. Each pixel has its own green sub-pixel, but uses an algorithm to “share” red and blue sub-pixels when necessary. Most of the time this won’t be a problem, and it can increase brightness and help with pixel density, but it will lead to artifacts in greys and possibly has something to do with the next complaint. Apparently, the Nexus One only uses 16-bit color. You know, the kind of color you had on your PC back around 1998? It has 32 levels each of red and blue, and 64 for green. The iPhone (like most quality mobile LCDs) has 18-bit color with dithering, which allows it to emulate full 24-bit color if you don’t look too closely. Sounds like a bunch of numbers, right? Well the chart above should illustrate it nicely, and the people who tested it say it’s pretty striking in vivo, and noisy as well. The bit count produces smooth color gradients on the iPhone, where on the Nexus One you’ll see banding. If you want to see your pictures the way they actually look, color depth is important. The display on the iPhone is actually significantly brighter, though its contrast is far worse. This is due to the Nexus One’s OLED nature, which allows blacks to be truly black (as in, no light there). In the end it’s kind of a draw, but the iPhone’s display wins by default because greater brightness means more visibility in more areas. I haven’t had trouble with my Zune HD outside, but I defer to their lab results. The scaling mechanism used to stretch or shrink images to fit the 800×480 screen is “laughably primitive.” If you’re not familiar with scaling mechanisms, it’s worth reading up on quickly, as you use them every day and likely aren’t even aware. For different content, resolutions, and color depths, different scalers perform worse or better, and it seems Google or HTC chose one that just doesn’t work very well. It can have a serious effect on image quality and text readability, especially when combined with that PenTile sub-pixel layout. So: strong words, but they seem to be backed up by real data (the shootout’s index page is here; the final part will run on March 1st). Remember that the Nexus One’s display is also going to be used in a number of other HTC products, like its twin the Desire and likely any other handset they put out with an 800×480 OLED display. The fact is, though, that LCD is an end-of-run technology that has been honed to as close to perfection as it’s ever likely to get. LCDs that cost $200 now would have cost thousands just a few years ago. OLED is the future — there’s no doubt about that. But in the present, devices like the Nexus One and Zune HD qualify as early adopters. While they impress in some areas, namely those in which the OLEDs outshine LCDs fundamentally (black levels and consequent contrast; power draw), there are still plenty of points on the LCD side of the board. It won’t be long before we start seeing much improved OLED displays — we are seeing them already in the form of Samsung’s simplified “Super AMOLED” in the Wave, which omits a piece of the display “layer cake,” allowing for better brightness and less reflectance. This rapid gaining of OLED on LCD has led to rumors that Apple will be adopting the technology for the next iPhone, which really is a pretty reasonable speculation. I haven’t personally inspected the Nexus One’s screen for more than minute total, and I don’t spend a lot of time around iPhones, so I can’t add any anecdotal evidence to this little duel. And it goes almost without saying that if the display works for you, then there’s nothing to worry about; this is purely an academic conflict for most. But go ahead and add your data point below. Update: People are noting that the Gallery app has some really bad compression when it loads pictures not at full rez, which would be the source of some of the banding for sure. As I noted, bad picture quality can result very easily from bad software, scaling, and so on. This is stuff Google tends to fix. So much for the banding, which appears to be a software issue, but that’s not the only piece of the puzzle. Thanks for adding that info.